2. HO T-5 indirect lighting at .5 W/sf in conjunction with task lighting at .2W/sf. 3. Shallow floor plates to maximize daylight penetration. 4. Continuously dimming daylight control. specific selective AFG Ti-R low -e coatings. Fiberglass frames. 6. Clear 4 - element Vision Wall framing for atrium. 7. 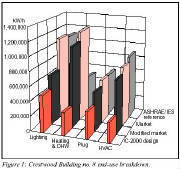 Opaque wall and roof insulation values R-20 for walls and R-35 for roof. 8. 35 KW Photovoltaic Solar Energy System. controlled by occcupancy sensors. Under floor distribution of piping. 10. Solar Domestic Hot Water System. 11. High effeciency condensing boilers. 12. Variable speed drives and high - effeciency motors. 13. Compartmentalised ventilation controlled by occupancy sensors. 14. Enthalpy ventilation heat recovery. 15. Water conserving plumbing fixtures and pressure reducing valves. landscaping and a green roof. This example is based on a northern climate.